So, I’m not sure it’s entirely fair to receive four rejections during the week of one’s birthday. Fair or not, that’s what happened this week. And that’s what happens sometimes when you send out a lot of work. Although I do think four rejections in one week is a new record for me. But in good news, I sent three of those stories back out again. I also finished writing Must Love Ghosts, which is the last episode in the Coffee and Ghosts serial. I’m thinking a season two is totally possible, although actual story notions for it are a little murky at this point. So, I’m heading into the home stretch with Must Love Ghosts. I think I can finish it this week. Pretty sure, anyway. Fingers crossed and all that. And … I’m taking another class, or rather, a series of classes. Yes, I know. I was going to take a break from them for a bit, but I couldn’t resist this offering. It’s based on Wired for Story by Lisa Cron, and it’s broken into smaller, two-week classes, each one based on a chapter in the book. That? That’s doable. 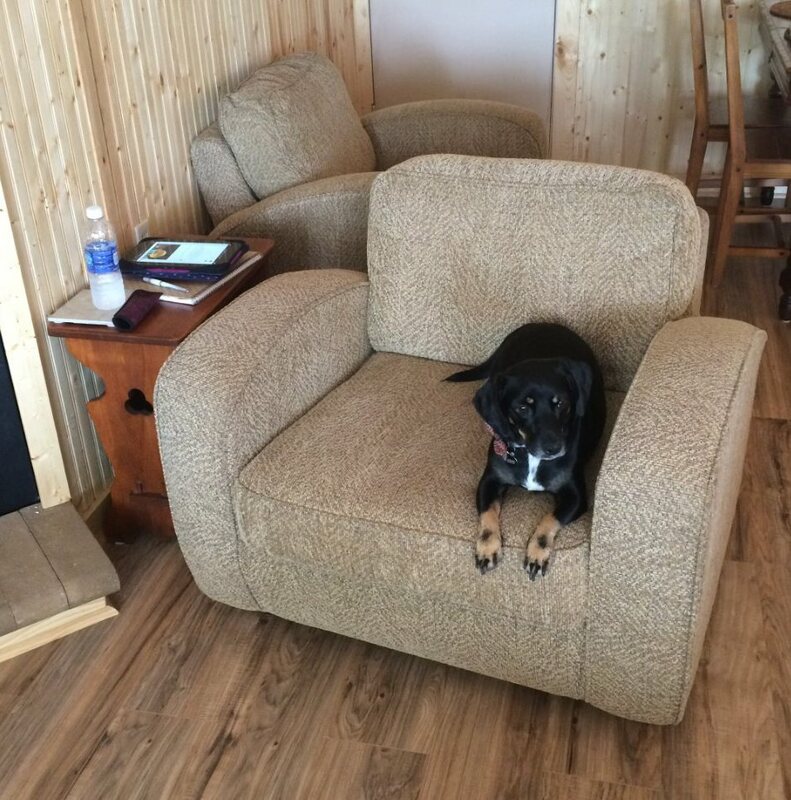 And it’s especially doable now that I have a spiffy summer reading/writing chair. Granted, I have to share, but there’s room for two. “I don’t believe in optimism. I believe in optimal behavior. That’s a different thing … Action is hope. At the end of each day, when you’ve done your work, you lie there and think, Well, I’ll be damned, I did this today. Terrific and inspirational advice but how, how, do you get there? How do you turn your hope into action? One way is to create a writing habit (which works an awful lot like an exercise habit–in fact, exercise has a lot in common with writing, but that’s fodder for another post). You can’t create anything worthwhile if you never start. So go. Start something. What that something is matters less than you think it does. So anyway, back in late November, when I was trying to figure out a way to start, I stumbled upon The Southeast Review’s 30-Day Writer’s Regimen. They were gearing up to run a version during December. I nearly didn’t do it. Come on, December? The holidays? How on earth was I going to write? Then I decided it would be a Christmas gift to myself. It was very low stress. All I needed to do for each prompt they sent was write a single page, longhand (that’s maybe 250 words for me). It didn’t even need to be about the prompt, just whatever came to mind after reading it. I missed a day or two (but oddly, not Christmas itself). One prompt inspired exactly nothing, so I wrote about my reaction to that prompt (wow, I have a whole lotta nothing for this one …). Some prompts got a page. Some built a continuing story, one became a poem, another a flash fiction piece. And one was the jumping off point for my very first Write 1/Sub 1 for the year, which ended up at ~8,000 words. All because I decided I could write a single, longhand page per day for thirty days. By doing so, I built a habit, one I happen to love. And … they’ll be running the Writer’s Regimen again in June. All new material. Still plenty of time to sign up. Anyone want to join me? So in the class I’m taking over at The Loft Literary Center, Breaking the Unwritten Rules in Middle Grade and Young Adult Fiction, we’ve been talking about clichés and tropes, and about all those unwritten rules we might not even realize are holding us back from something original and startling. We’ve discussed narration and how to balance entertainment with authenticity when writing a middle grade or young adult character. It reminded me of something Kyra said a while back. One day after school, she mentioned she had something on her “bucket list.” After I got over my internal freak out about my ten-year-old having a bucket list, I asked her what she meant. Here’s the thing: she’d never heard the phrase “kicking the bucket.” If she saw it in a story (or heard it in a movie) she would probably ask me what it meant if it wasn’t clear from context. 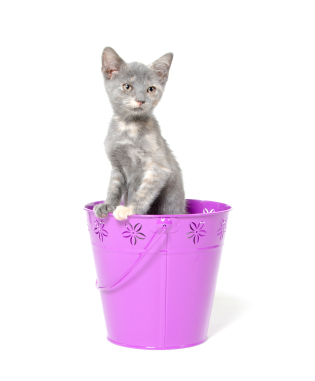 To her (and her friends), a bucket list represented a figurative bucket where they placed all the things that they’d like to do someday. painting all her pets’ portraits. So, as writers, we’re told to avoid clichés because they’ve lost their freshness and meaning. But in some cases, all it takes is the next generation to give the old something new. So, for a variety of reasons, I decided to take a poetry class. Poetry is one of those things that has always mystified me–it’s cryptic and obscure and part of me was certain this was a mistake. Guess what? I’m kind of loving it. It’s not always easy. This week’s assignment was to write a sonnet. Fortunately, the only requirement we had to meet was the fourteen lines. The ten syllables per line and the rhyming scheme were optional. I gave up on the rhyme early, but I wanted those ten syllables per line–and I was going to get it. So I sat in the lobby where Kyra takes dance and beat out syllables on my notebook. You know how some horses can “count” with their hooves? Yeah. It was kind of like that. something else. 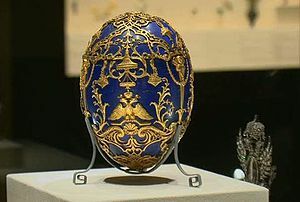 So naturally, I wrote about Carl Faberge. My instructor didn’t respond–and didn’t respond. I figured I broke the class or at least his mind a little bit. You should check out some literary magazines you like and send it out. As if it’s that easy. And I’m thinking: Here’s my secret talent. Finding the most unmarketable subject ever and rendering it in the least commercial form possible. If “Two Hammers” (yeah, an inspired title, that) ever finds a home, you’ll be the first to know. So, Andrew is taking Perspectives in American Literature this semester–and already they’ve been reading like gangbusters. Well, if gangbusters read, that is. More accurately, they’ve been reading like high school sophomores in Perspectives in American Literature. Once I figured out it’s one of those books without a plot, I kind of liked it. Everyone in class is complaining about this, but I’m enjoying it. I told him he might. He just might. Let’s try a writing book this week, shall we? 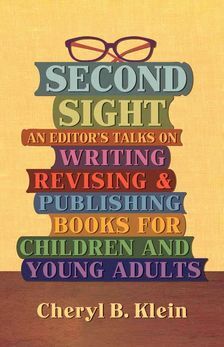 From Second Sight: An Editor’s Talks on Writing, Revising, and Publishing Books for Children and Young Adults, by Cheryl B. Klein, pages 217 – 218. Oh, I love that. It gets it just right, I think. When we did our blog tour for Geek Girl, Darcy and I would often refer to the “hopefully ever after.” But I think this is better. And it’s not really a spoiler, since Second Sight is a book of essays, so you don’t need to read in order if you don’t want to. Cheryl also has a lot of excellent information online for YA and children’s writers. Check out her blog and her website.